CHANDLER, Ariz. — The City of Chandler on Jan. 21 dedicated a kiosk at Nozomi Park with display panels that recount the history of the War Relocation Authority’s Gila River camp. Guests of honor at the ceremony, held at the Tumbleweed Recreation Center due to inclement weather, included Nisei who played baseball while incarcerated at Gila River. The 30,000 Japanese Americans who were detained in Arizona during World War II (at Poston as well as Gila River) were honored. The speakers were introduced by Jody Crago of the Chandler Museum. Furukawa also shared a haiku he had written for the occasion. Kenso Zenimura, one of Kenichi’s sons and second baseman for the Gila River All-Stars, recalled that when the war broke out, “Mr. Furukawa went to Tulare Assembly Center and my family went to Fresno Assembly Center. There were other assembly centers because a lot of the camps in Arizona and Arkansas and Colorado were not completed … I remember it was my birthday that we went into camp. I was only 15 years old. My brother [Kenshi] was only 14. Zenimura, who later played for the Hiroshima Carp, recently found both Fresno Assembly Center and Gila River championship pennants in a trunk in his garage, both of which he donated to the Fresno-based Nisei Baseball Research Project. He recalled helping his father build Zenimura Field outside the barbed-wire fence, leveling the ground and screening the dirt for pebbles, which was “just like looking for gold.” He also said that getting water to the field was a challenge; the family first enlisted the aid of farmers who volunteered for the camp fire department, and later dug a trench to connect a pipeline to the laundry room. After camp, Zenimura played in college and later played in Japan and Canada. After retiring as a player, he became involved in youth baseball — coaching boys who were the same age as him and his brother when they went to camp — and participated in the World Boys Baseball Tournament in Japan, Mexico, Brazil and other countries. He retired in 2005. Kenichi Zenimura returned to Fresno after the war, continued to play competitive ball until he was 55, and continued to manage until his death in 1968 at the age of 68. The kiosk ceremony almost coincided with his birthday, Jan. 25. Marshall played in Japan and managed the Chunichi Dragons. “I learned a lot about Japan, the Japanese people and culture, the loved, the discipline that they have when they play the game. I enjoyed every minute that I was there,” he said. 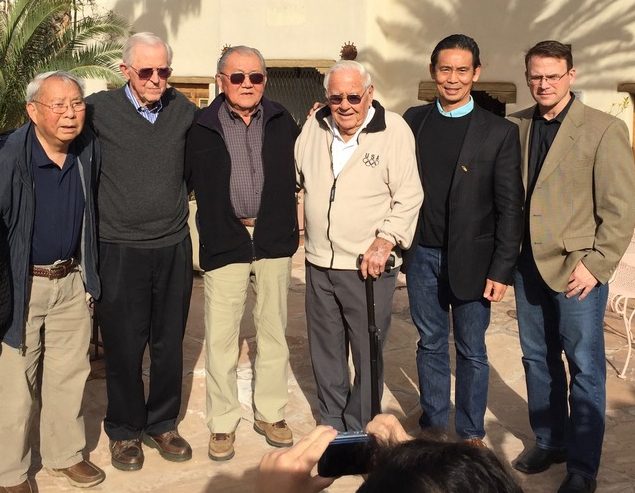 He recalled his friendship with Japanese baseball greats Sadaharu Oh and Shigeo Nagashima as well as Wally Yonamine, a Nisei who played and managed in Japan, and Tom Ikeda of Mesa, Ariz., who brought the Taiyo Whales to the U.S. for spring training. Bill Staples of the Society for American Baseball Research, who is also a member of NBRP and JACL, paid tribute to people involved with the kiosk project who have since passed on, including former ballplayer James Tomooka, Mas Inoshita, and Ted Namba.